If you want to start a new career, with full training and the ability to control the hours you work AND the money you earn – then complete this form today. Just hit SEND and we will be in touch straight away. Our job is to develop your knowledge, correct any bad habits and then teach you the skills you will need to train others. If you think about it, you already know how to drive, you know most of the signs and road procedures, and although it would not be to the standard we require of a professional driving instructor, you could probably teach someone to drive at present. We have therefore developed a range of training courses to suit your needs. Once enrolled on a Lanes instructor training course you will be supplied with all reference books recommended by the DVSA and offered classroom sessions in our training suite where one of our trained instructors will be available to guide you through the syllabus. You will have the opportunity to practice with over 400 hazard perception clips and to see a range of educational DVD’s. Our Part II training is designed to demonstrate and tutor you to a high standard of driving required for the practical test. 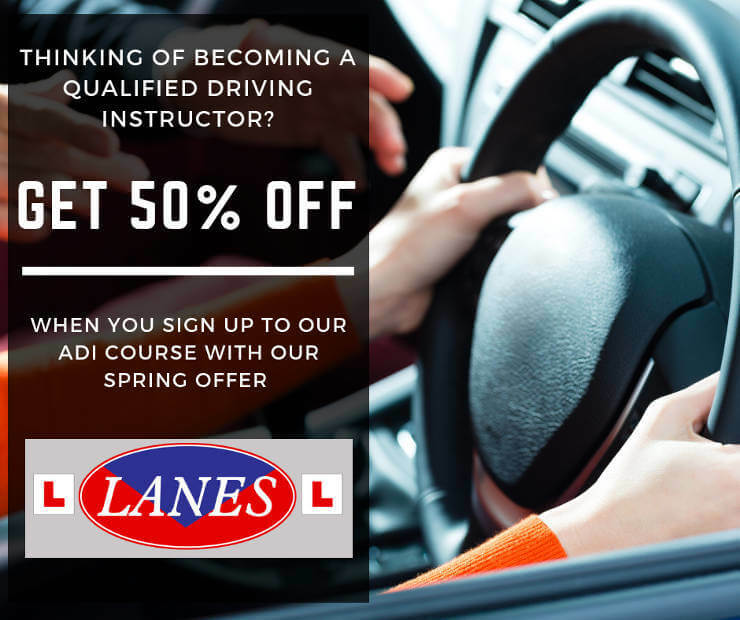 We offer a practical in-car driving skills course, which includes an assessment drive and unlimited further training to perfect your driving skills. 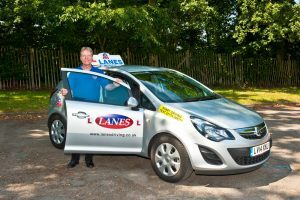 On passing the Part II test you can start working as a Provisional Driving Instructor within the Lanes Group of Driving Schools. We offer unlimited practical in-car instructor training together with classroom tuition. The courses are structured to the individual with training sessions in two hour blocks – this enables you to fit your training around your existing work. Using our unique Lanes training manuals and audio CD’s you will find training both constructive and enjoyable. If you wish to take advantage of the six-month provisional license to teach, you must by law, complete a further twenty hours in-car training before you can take the Part III test. A separate package is available for people participating with a Trainee License. If you fail, you are allowed as many attempts as necessary for the Part I test, but only three attempts each at Parts II and III. Therefore it is very important that you are thoroughly prepared before attempting any of the tests. The Driving Standards Agency recommend that you take a proper training course before you take each part of the qualifying tests. A Trainee License is issued by the government under a scheme that allows you to take a six month ‘provisional license’ to teach once you have passed the first two parts of the tests: this can be achieved in as little as 6 weeks. The DVSA stipulate that you must be sponsored by a driving school as a Trainee Instructor, and that you must receive a minimum of forty hours training before you will be allowed to teach pupils. Once you have received this training you will be eligible to be issued with a Trainee License. In addition you are required to undertake a further twenty hours of training during the first 3 months of the issue of your Trainee License. A separate package is available for people participating with a Trainee License. You will now be allowed to teach as a Trainee Instructor allowing you to earn an income whilst training towards successful completion of Part III. The main purpose of our training programme is to provide good quality driving instructors to work within the company. However, some people may wish to work as an independent instructor. Our training is structured to suit anyone wishing to become an Approved Driving Instructor. If you choose to work and gain experience in those all important first few years within the Lanes Group of Schools it will be under a very comprehensive Franchise agreement. We can offer you a dual-controlled car, taxed and insured with AA breakdown cover; the cars are normally replaced every 6-9 months. The car is fully liveried in the traditional style and is covered for all eventualities with a replacement car available if necessary. It can be used for social, domestic and pleasure when not being used for teaching purposes. A full office support service comes with your franchise, which includes advertising on the Internet as well as local newspapers and directories, coupled with the excellent name of Lanes which has been associated with driving since 1914. A high standard of living is attaining Lanes with earnings in the region of £20 -£30 K p.a. Once Fully Qualified we will automatically offer you a position within the Lanes Group or one of its associated companies. Please ask about our Trainee License package specially designed for our course participants.